Last month, my family rode our bikes to Mackenzie Glen District Park in Maple. As you can see in the video clip (which is the segment near the Maple Community Centre), my son really enjoys riding with me using a trail-a-bike. However I see now that he doesn't always pay attention! 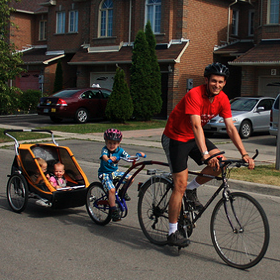 The 2km journey each way is very easy by bike, and fun for the whole family.